Before a baby is born, there is a fifty-fifty chance that I could be considered as the mohel. My standard line, when people ask me if I'll travel to circumcise their child, is "Only if it's a boy. I don't touch the girls." I have had many friends call to APOLOGIZE (I kid you not) when their daughter was born. "Sorry we can't give you the business," they say. "I tried to get my wife to have a boy... But what can we do? She didn't listen to me!" While I think the apologies are unnecessary - I, for one, am very happy for them. I am glad they have a healthy baby. And, of course, God knows (as do we all) that we need girls too. So I won't have a bris. Believe me - when it's a girl, it doesn't bother me. But I think this week I received the funniest "apology" of all time. 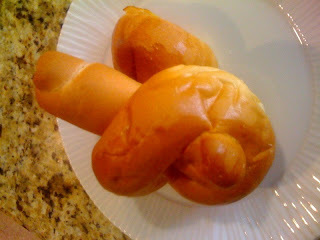 A father of a newborn baby girl dropped off a challah roll that his family had on their table for shabbos, with a note saying "Dear Rabbi, THIS is the only bris I can give you. Cheers!" I am putting a photo of the challah here in an angle that I hope is not too suggestive. At the same time, it doesn't take a whole lot of imagination to see what he is talking about. Maybe it looks like a thumb with a fingernail. The person who makes the knot in the bread either needs to be fired or rewarded for his (or her) ingenity. As for me, I thanked him for the bread and said the requisite blessing - "Hamotzee Lechem Min Haaretz." Amen. Was there a schlissel in that challah? What Is Done With the Foreskin?